Shaun Malligan, Co-Founder, KOOEE! 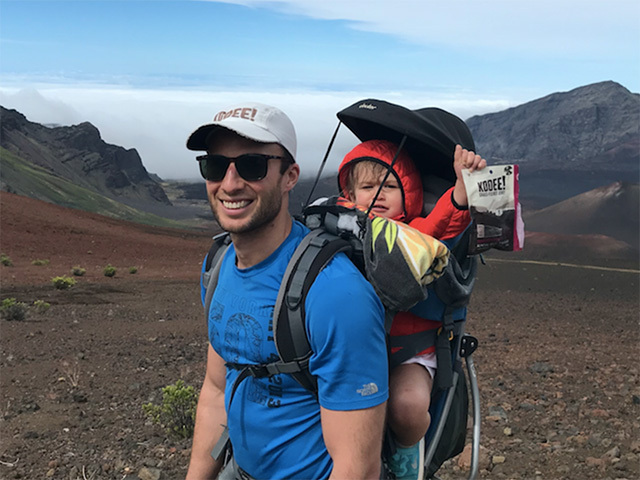 Natural Snacks states: "When you're balancing work, family, friends and health – more often than not, it's the latter that gets short changed. So here's some tips on how to make sure you're staying fit and healthy, while making sure you're the best dad and partner you can be. " Rise early and get the exercise worm. Whether you run, cycle or go to the gym, the best thing is to rise early – and be done early. While afternoon exercise often is subject to work meetings, family dinner time and everything else in between, morning exercise doesn't have the same interruptions. Plus, you'll stoke your metabolism, clear your head and feel great for the rest of the day, particularly if you have a job that requires you to sit! If you're unable to get outside because you're in charge of the little one, then no fear: have your kid come with you! The best thing we ever bought was a great running stroller, which I use all the time. That way, you can get your exercise out of the way while your child takes in some fresh air and (hopefully) gets in a nap. We often run past playgrounds which we stop at, allowing my daughter to get some fun exercise in too, and always finish at a café. 1 Babycino please. Whether it's outside pushing my daughter on her scooter, or showing her how to climb trees outside, there's nothing better than watching your child have fun with you while staying active. Some of my best memories as a kid was having one-on-one time with my dad outside – whether kicking a footy or running in the park, so I'm determined to make an effort for my daughter too. One routine that I've started during her night-time routine is a simple form of Acroyoga – where she balances on my hands and legs – though we're finding progress tough between the squeals of laughter. During the busy work day, time is short and you can be easily tempted by snacks that are within reach. Pre-empt this by making sure you have a selection of healthy snacks around you, that you can pull from your bag or work-desk to get you satiated between meals. A bag of almonds, some fruit and some quality protein (I'll alternate between a bag of our jerky, or some full fat Greek yoghurt with some quality Peanut Butter on top). You'll feel better about it than a bag of chips!